Platinum Luxury Auctions and William Pitt Sotheby’s International Realty have announced the pre-auction sale of the property known as Sunset Hall. 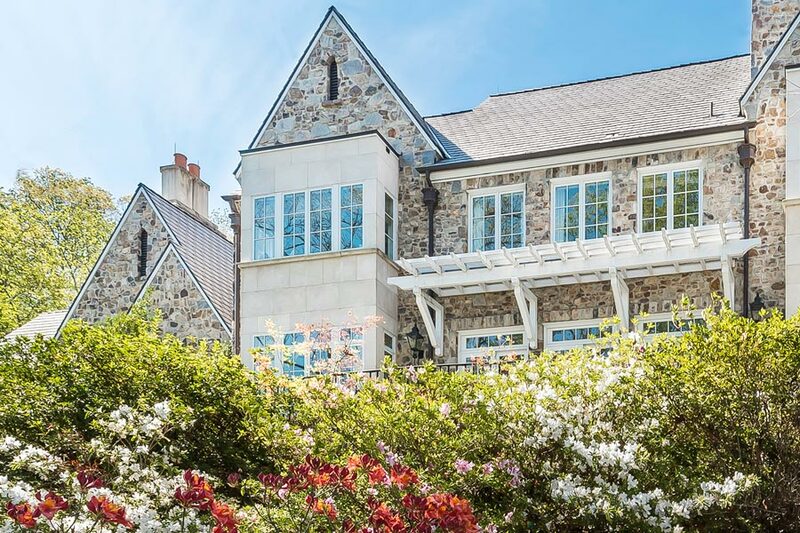 The Ridgefield, Connecticut residence was scheduled for a live, luxury auction® sale on May 19th. Though previously listed for $5.75 million, the home was offered “without reserve,” meaning the auction’s highest bidder would become the new homeowner, regardless of the amount of the hid bid price. Miami-based Platinum, a firm specializing in the non-distressed auction sale of multimillion-dollar properties on behalf of their private owners, collaborated with listing agent Laura Freed Ancona of William Pitt SIR for the sale. Such was the case with Sunset Hill. The buyers, a married couple who the parties declined to identify, had previously viewed the property prior to it being scheduled for the auction sale. “They simply could not be convinced to put pen to paper, however, until the threat of the auction,” added Mr. Ashcroft. The Georgian-style estate sits on 7 manicured acres in Ridgefield, a posh community within Connecticut’s Fairfield County. Original owner James Stoker (U.S. Ambassador, banker and active supporter of the YMCA) built the mansion in 1912 on one of the highest elevation sites in Ridgefield, which now provides for views of the Manhattan skyline on a clear day. Stoker wasn’t Sunset Hall’s only high-profile owner. Subsequent owners include the brother of Harry Houdini, Brooklyn multi-millionaire and beer baron Samuel Rubel and famed actor Robert Vaughn. The estate was even anointed as home to the United Nations in 1946. In total, the property offers 10 bedrooms, 8 full and 4 half baths. The main residence boasts nearly 12,000 sf, while a separate guesthouse adds 1,500 sf. Property features include a tennis court, 65-ft heated pool, a 4,000-sf limestone pool terrace, 9 fireplaces, a marble-floored, 50-ft ballroom, formal dining and a gourmet kitchen. The residence has been listed on the National Register of Historic Places since 1984. Inquiries on the sale can be directed to a Platinum associate at 800.262.5132. Additional details can be found at SunsetHallLuxuryAuction.com. 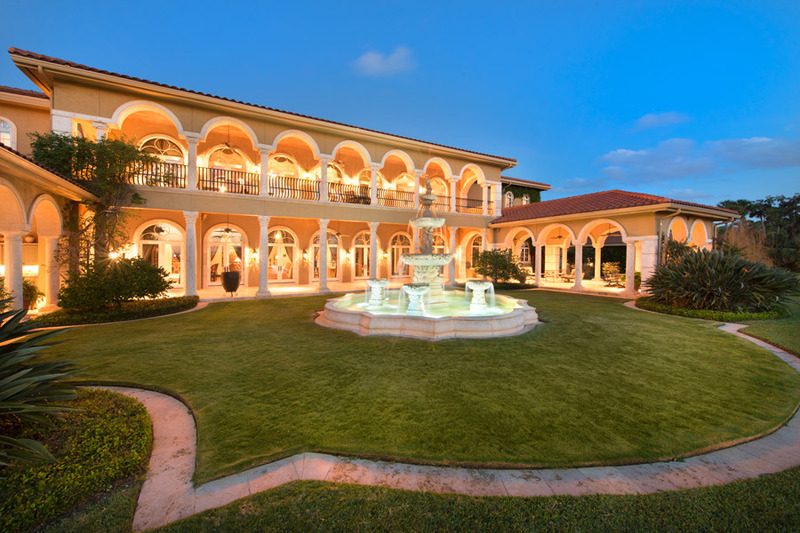 Miami-based real estate auction firm Platinum Luxury Auctions has announced the planned auction of a waterfront mansion owned by members of the France family, the founders and owners of NASCAR. Located in Daytona Beach, Florida, the sprawling waterfront estate will be sold at a live auction without reserve, meaning the highest bidder will become the new owner of the property regardless of the high bid price. The luxury auction® sale is scheduled for June 3, 2017, with bidders being able to participate in person on the property site, or remotely via telephone. The France family retained Platinum, a firm specializing in the non-distressed auction sale of multimillion-dollar homes on behalf of their wealthy owners, to exclusively manage the transaction. Platinum is also a Florida real estate corporation. The property was built and owned by Bill France Jr. and his wife Betty Jane France. Bill Jr.’s father, Bill France Sr., founded the National Association for Stock Car Auto Racing – or NASCAR – in 1948. Bill Jr.’s son, Brian France, acts as the current CEO and Chairman of NASCAR. The France family has maintained ownership of the business while growing it into a globally prominent motorsports empire. After Bill France Jr. passed away in 2007, Betty Jane lived in the home until her passing in August of 2016. She was well known for her charitable and philanthropic endeavors, which included founding the NASCAR Foundation in 2006, a non-profit organization focused on helping children in need across the United States. Although never previously offered for sale, the residence was appraised for $13.8 million in 2013. While this appraisal figure only represented the value of the home itself, potential buyers will be pleased to know that the sale of the property will include all of its current furnishings. “The prospect of having to furnish a house like this one from scratch would be daunting, not to mention pricey. It’s a task that could easily have a seven figure price tag,” noted Trayor Lesnock, Platinum’s founder and president. The property is certainly unique, occupying 3.8 manicured acres with 325 feet of water frontage on the Halifax River. There is also a 150-foot boat dock able to accommodate multiple vessels, in addition to a custom pool, outdoor kitchen/bar, and various loggias and terraces offering beautiful water views. The estate’s main residence offers more than 17,000 square feet, while a separate guesthouse adds another 1,700 square feet of living space. In total, there are 5 bedrooms, 7 full and 6 half baths. Though the home is appointed with the finest finishes, it blends elegance with comfort to create a living environment that does not feel stuffy or overstated. The relatively modest bed and bath count compared to the size of the property allows for rooms to be very large and spacious, with a sprawling master suite and three other guests suites – each with an en-suite bath – being located on the more private, upper level of the main residence. Other property features include a grand “River Room” perfect for entertaining, a commercial-grade elevator, dual spiral staircases, a “hidden” wine cellar and tasting room, a private hair salon, gourmet kitchen, fitness center, built-in home audio system, and a fleet of 24/7 surveillance cameras. The property is available for previews by interested buyers between the hours of 12 and 4pm (EDT) daily, until the auction. Visitors are encouraged to schedule their viewing appointment in advance. Additional information is available at RiverfrontLuxuryAuction.com, or by contacting a Platinum representative at 800.676.9581. 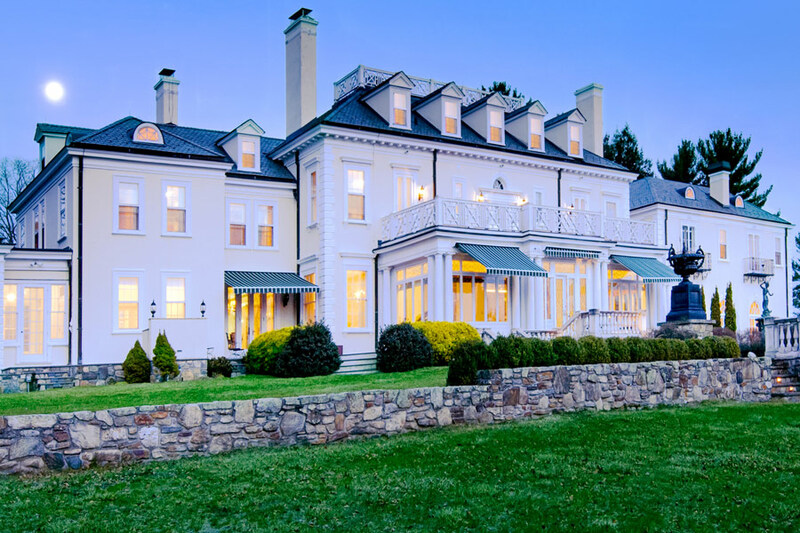 On Friday, May 19th, the 7-acre, residential estate known as Sunset Hall in Ridgefield, Connecticut will be sold to the highest bidder at a live auction held on the property site. Although previously listed for $5.75 million, the home is being offered “without reserve,” and will be sold to the highest auction bidder regardless of the amount of the hid bid price. Miami-based auction firm Platinum Luxury Auctions is managing the sale in cooperation with listing agent Laura Freed Ancona of William Pitt Sotheby’s International Realty. The property owner retained Platinum, a firm specializing in the non-distressed auction sale of multimillion-dollar properties on behalf of their private owners, to assist in the sale of the home after growing tired of the traditional brokerage sales process. With sweeping views of Long Island Sound and the Catskill Mountains, the Georgian-style estate sits on 7 manicured acres in Ridgefield, a posh community within Connecticut’s Fairfield County. Original owner James Stoker (U.S. Ambassador, banker and active supporter of the YMCA) built the mansion in 1912 on one of the highest elevation sites in Ridgefield. As such, the skyline of Manhattan is visible from the property on a clear and sunny day. (A drive into the city requires only one hour). Stoker was followed in his ownership of Sunset Hall by a series of well-known individuals, including the brother of Harry Houdini, Brooklyn multi-millionaire and beer baron Samuel Rubel and famed actor Robert Vaughn. In fact, the estate was even anointed the home of the United Nations in 1946. In total, the property offers 10 bedrooms, 8 full and 4 half baths. The main residence boasts nearly 12,000 sf, while a separate guesthouse adds 1,500 sf. Property features include a tennis court, 65-ft heated pool, a 4,000-sf limestone pool terrace, 9 fireplaces, a marble-floored, 50-ft ballroom, formal dining and a gourmet kitchen. While the residence has been listed on the National Register of Historic Places since 1984, the owner notes that it is not burdened by the excessive limitations that can be placed on such properties – such as strict rules on repairs and renovations – because it is not located within Ridgefield’s own historic district. To be sure, the owner performed various renovations and improvements to the property when she and her family purchased it in 2008. Bidders must register to attend and participate in the auction sale, and the deadline by which they can do so is Thursday, May 18, 2017 at 5pm EDT. Registration stipulates that a bidder makes a refundable deposit of $100,000, in addition to signing the auction’s terms of sale. Bidders can participate in the auction on-site, or remotely via telephone. Interested parties are encouraged to contact a Platinum associate at 800.215.3183. Additional details can be found at SunsetHallLuxuryAuction.com. A luxurious mountainside estate located just south of Denver and boasting features fit for a hedge fund titan or Hollywood movie star has been scheduled for a live auction sale on May 20, 2017. Platinum Luxury Auctions, a Miami-based auction firm specializing in the non-distressed auction sale of multimillion-dollar properties on behalf of wealthy homeowners, is managing the auction sales process in cooperation with listing agent Stephen Brinley of SCB & Associates in Durango, Colorado. After entering the market at an original asking price of $5.2 million, the residence will now be sold to the highest bidder without reserve and regardless of the high bid price. The live auction will be held on the property site, with qualified bidders able to participate either in person or remotely. The property is located within the upscale community of Castle Pines Village, a private enclave of luxury homes located in the city of Castle Rock, just 25 minutes south of the heart of Denver. With 2,800 acres of land and a development plan that preserves the beautiful natural surroundings, the Village is ideal for those looking for serenity within Colorado’s great outdoors. Community amenities include three recreational centers – offering swimming pools, tennis, volleyball, basketball and multipurpose fields – thirteen miles of trails and two private golf courses. Designed by Nicholas Custom Homes and the Phoenix Design Group, the estate features impressive architectural details such as custom, oversized windows, a cross-gabled roof, custom lighting and built-ins, and a “floating glass” walkway above the two-story foyer. The residence has four levels: two, uppermost living levels offering more than 9,000 square feet, a finished lower level with more than 3,000 square feet, and a subterranean, automotive “vault” able to accommodate 10 vehicles. In total, there are 8 bedrooms, 9 full and 2 half baths. On the lower living level is one of the home’s most impressive features: a private spa so posh that one could easily believe that he has just stepped into a five-star resort. With climate/humidity control throughout, a sauna, steam room, marble hot tub with infinity edge, in-floor radiant heat, and a private massage room with wash basin and shower, trips to a commercial spa will become a thing of the past. For the auto enthusiast, the home’s subterranean garage is sure to please. Equal parts lounge and working garage, the space offers a cozy retreat for both man and machine. Features include a wash/detailing bay, wet bar and entertainment area. Additional features include a keyless entry system, heated driveway, multiple fireplaces, fitness center, motorized window shades, and a gourmet kitchen with top-of-the-line appliances. The residence is available for previews by interested buyers between the hours of 12 and 4pm (MDT) daily, until the auction. Due to the gated security of the community, those wishing to visit must contact Platinum in advance, by calling 800.269.1173, or by visiting CastleRockLuxuryAuction.com. A lakefront estate located in The Cliffs at Keowee Falls community in Salem, SC has been sold as the result of a live auction on May 6th. According to Platinum Luxury Auctions and Justin Winter Sotheby’s International Realty – the firms that cooperated for the sale – Oconee County property records show that the auction created the highest sales price within the lakeside community since 2011. While the exact sales price will not be released until closing, a representative for Platinum confirmed that the sales price was in excess of $2.1 million. The auction had a reserve price of $1.25 million. Miami-based Platinum worked in close cooperation with listing agent Justin Winter for the sale. Situated on 1.8 private acres and boasting 560 linear feet of lake frontage on Lake Keowee, the property attracted five bidders who gathered on its waterfront terrace to competitively bid for the opportunity to own the home. Platinum reported that the winning bidder was a financial services professional who had been looking at lake homes in the South Carolina and Georgia markets for some time. Boasting an English manor-inspired design, the +6,000-square-foot residence features four bedrooms, four full and two half baths. Morgan-Keefe luxury homebuilders, Neal Prince and Partners design, and Pulliam-Morris decorators in Columbia, South Carolina were recruited by the property owner to build the estate, which was completed in 2006. Features include a gourmet kitchen with separate butler’s pantry, executive wood-paneled study, and spacious lakeside terraces and balconies. Additional amenities include a covered boat dock with lift, wood-burning fireplaces, fitness room, outdoor barbecue grilling station, and a 3-vehicle garage. Additional information is available at PlatinumLuxuryAuctions.com, or by calling 800.262.5132.